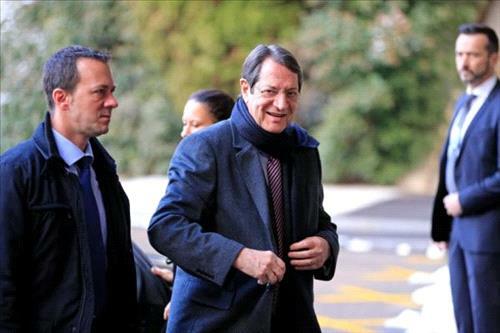 AMMONNEWS - Cypriot President Nicos Anastasiades arrived to Amman on Sunday to participate in the second round of the trilateral Jordan-Cyprus-Greece Summit to be held in Jordan. Upon arrival, the Cypriot president was welcomed by the minister of foreign affairs and expatriates, the mayor of Amman, the Jordanian ambassador to Cyprus, the ambassador of Cyprus in Amman and a number of civic and military officials. Greek Prime Minister Alexis Tsipras also arrived in Amman yesterday to take part in the summit which will focus on means to expand cooperation between the Kingdom, Cyprus and Greece in various fields, mainly economy and investment, and building on the outcomes of the first summit that Cyprus hosted in January 2018. The summit will also go over the latest regional developments and endeavours to achieve peace in the region.